Bunde also leads a teaching circle to support professional development of teachers and serves on several committees, including curriculum, assessment and planning, Myatt said. 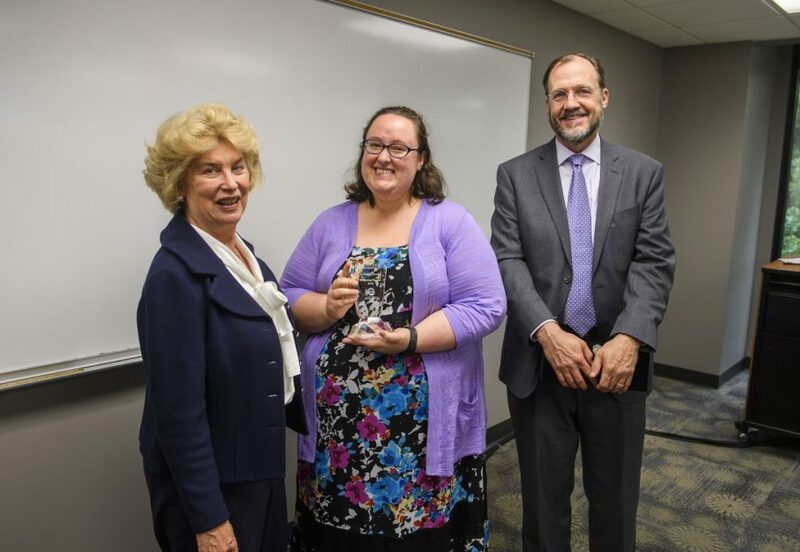 “I was surprised and humbled to receive the Kramer award,” Bunde said. “The DWR is filled with extraordinary educators, and I know that working with them makes me a better teacher every day. In their nominations, students highlighted that Bunde instilled confidence in their writing abilities, encouraged active learning and built a community in her classroom. Another student highlighted the safe environment Bunde creates for open dialogue. “She always had group discussions and encouraged everyone to respond,” the student wrote. “She would ask us to respond to recent events in pop culture and the world around us, and then asked us to propose a solution. The award includes a $1,000 stipend and engraved crystal memento. Bae Magruder established the Kramer award in 1986 in memory of her brother, X.A. Kramer Jr. The Kramer endowment supports the university’s writing and rhetoric program. Nominations for the award open Feb. 1 of each year for instructors who taught in the preceding calendar year.